How does Arctic Hat work? Arctic Hat as the name suggests is a special hat that claims to keep your head 20 degree cooler than the outside temperature. The Arctic hat is available in two versions – Brimmed Hat and the regular Cap. The science behind the Arctic Hat is the principle of Evaporative Cooling. The Arctic Hat also claims to have a built-in UV barrier that reflects sun’s UV rays. As mentioned earlier the Arctic Hat works on the principle of “Cooling by Evaporation”. The fabric of the Arctic Hat has tiny pores that releases water for continuous cooling. Evaporative Cooling is the same principle that makes you feel cool when you sweat. The heat from the surrounding makes the water in the Arctic Hat to evaporate, which is released from the tiny pores in its fabric. The evaporation results in reduction of temperature as the latent heat is removed from the surface of the cap. Construction of the Arctic Hat – The material of the Arctic Hat claims to be light-weight, breathable and features ventilated panels that allow air to flow freely. Uses of Arctic Hat – As per the infomercial the Arctic Hat is suitable for all outdoor activities like beach, hiking, working in yard, camping, by the pool etc. Anti UV Feature – The Arctic Air Hat along with the evaporative cooling feature also claims to be UV resistant and goes to the extent of being 99% UV-resistant and claims to reflects 80% of the sun’s heat. Material of Arctic Hat – The Arctic Hat is made from Performance Fabric. The Performance Fabrics are known to be resistant to elements of nature like rain and cold. How to use the Arctic Hat? – You are supposed to soak the hat or cap in water and wring out the excess water. Arctic Hat – The name portrays chilliness and is aptly selected to reflect on the character of the hat. The word “ARCTIC” is also associated with the popular by the as seen on tv cooler “Arctic Air Cooler” – which too works on the evaporative cooling principle. So it is pretty evident that the manufacturer of the Arctic Hat is trying to capitalize on the name “ARCTIC” by associating it with already popular cooler. Ok now lets review the claims made by the manufacturer of the Arctic Hat. “20-Degree Cooler than the Outside Temperature” – This is the most outlandish claim made by the manufacturer of the Arctic Hat. Evaporative Cooling cannot reduce the temperature by this margin. also they do not produce any lab test to prove the claim. Do not believe such claims. “Blocks 99% UV Rays” – Whenever there are claims that cite statistics it is expected to be backed by relevant tests. 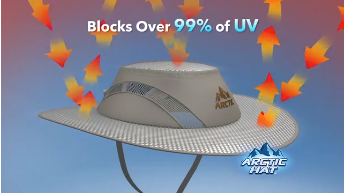 The makers of the Arctic Hat claim that the hat blocks 99% UV rays so the question that you should ask is how did they arrive to this number of “99%” – they have no answer to such questions. They do not mention what material is used in the Arctic Hat to block the UV-rays. 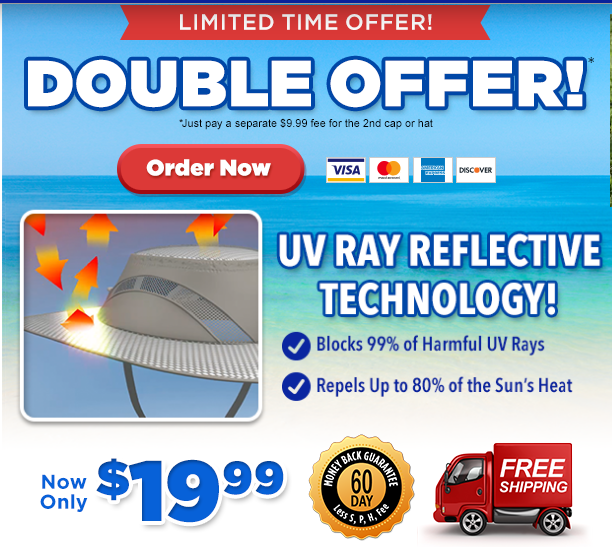 “Repels 80% of sun’s heat” – again the same story. No data and independent tests that would support these claims. They do not mention what is the material in the cap that repels the heat. 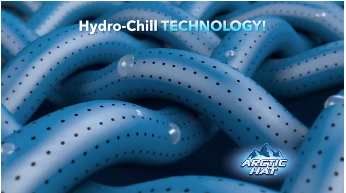 “Hydro-Chill Technology” – I admire these as seen on tv marketers for their inventiveness in coming up with scientific jargon for stupid things. Now wonder this inventiveness is what has helped them sell their crappy product. This “Hydro-Chill Technology” is just one of those jargon that has no basis. “Hydro” is water, “Chill” is cooler temperature. They use this scientific term to explain the science behind the cooling. The lining fabric of the Arctic Hat has numerous tiny pore through which the water evaporates, cooling the hat. “Breathable and Lightweight Material” – There is nothing special about it. all hats and caps have this feature. “Makes you feel Comfortable All Day Long” – This is not true, you will remain cooler only for a couple of hrs not all day. More they surrounding heat the sooner the water in the cap is going to evaporate. You need to soak it several times and keep it “wet” to get the cooling effect. “Personal Air Conditioner” – Nope, don’t get sucked by such claims. The effect is not even like a cooler. “Fully Adjustable” – What is it in a cap that needs to be adjusted? “One size fits all” – Remember if anything is “One size fits all” that means that it is designed to fit bigger things. So when you consider the Arctic Hat, it is going to fit lose for people with smaller heads, especially kids. Arctic Hat reviews on buyarctichat.com – These are paid reviews posted by people who get paid from the manufacturer. So don’t get carried away by such reviews. Arctic Hat is available only with the official website – BuyArcticHat.com. The ordering process of the Arctic Hat is complicated, confusing and is designed to benefit the seller and not the buyer. First the “Buy 1 Get 1 Free” option is pre-selected, in this BOGO FREE offer you get 2 Arctic Hats for the cost of $30. If you have to order just one hat you need to un-select the BOGO FREE offer. Many buyers don’t realize this and end up buying two hats. Arctic Hat is one of the stupidest as seen on tv products we have seen in the recent times. Its not that the Arctic Hat is totally useless, the benefits are too far-fetched. Also Arctic Hat is not the only outdoor cooling hat out there in the market. There is a tried and tested one that goes by the name “Ergodyne Chill” and is priced at $15 on Amazon.com. We would recommend the Ergodyne Chill over the Arctic Hat. Thank you for seeing this product as it really is: a money making item for the seller. ANY wide brim hat of light weight material will do what this claims to do, and for less money. One size fits all? A close look at the woman wearing the hat shows excess hat area around her head and if there is a wind, she had better tighten up that chin strap.